This gloves made for mild and cold winters. Have liner inside. Protect you're hands from wind and from water. You can use them with weapon. Composition: 100% polyamide. Encapsulation silicone. • Use insulation with insulated suit for extreme cold weather. Do not use with small objects, devices and weapons, which It requires precision motion. • Fabric upper repels moisture and protects from snow and wind. • The heater does not absorb moisture, keeping warm. • Lightweight and compact (easy to fit in the side pocket of his jacket). • It is possible to mount mittens on the sleeves of the suit jackets insulated to prevent loss. • Easily drag on for size with the help of wide straps and buckles in the area wrists. 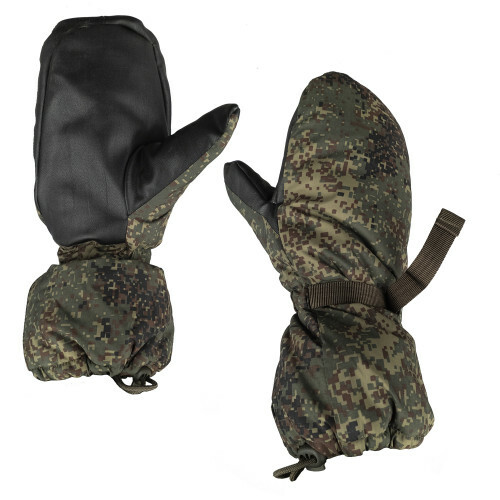 • Supplied complete with additional removable fleece insulation.